In research conducted at UCL and published last month in Clinical Psychology & Psychotherapy, 67% of clinical psychology trainees who completed our survey considered themselves to have lived experience of a mental health problem. This number, while higher than we expected, is perhaps not too surprising given what motivates people to pursue a career in clinical psychology, as well as the stresses of training themselves (alongside the fact that trainees with lived experience are more likely to have responded to the survey). What was particularly striking about the research findings, are the various factors that seem to be associated with trainees’ anticipated likelihood of disclosing this lived experience, and the implications that follow. Amongst trainees, one of the factors that was most consistently associated with lower likelihood of disclosure is a construct that has come to be known as ‘maladaptive perfectionism’. Maladaptive perfectionism is characterised by rules and beliefs such as ‘people will probably think less of me if I make a mistake’, ‘even when I do something carefully, I often feel that it is not quite right’ and ‘I never felt like I could meet my parents’ expectations’. The idea that individuals who strive for perfection might conceal aspects of themselves they consider to be ‘imperfect’, is not a radical one, but it may be especially relevant for trainees. The arduous and competitive process of gaining a place on a clinical psychology training programme is likely to both appeal to and encourage an already perfectionist nature. Another factor that was associated with likelihood of disclosure was who the person discloses to or contemplates disclosing to (the disclosure ‘recipient’). Trainees overall felt that they would be less likely to disclose a mental health problem to course supervisors, tutors and members of their training cohort than to family members and friends. There were exceptions to and nuances within this pattern, but the results suggested that trainees do feel reluctant to share mental health problems with people involved in the training process. Trainees’ comments, not published in our article, indicated that there are a variety of reasons for this. One theme that stood out in trainees’ comments was the attitude, ‘I would disclose if necessary or if relevant’. But how do trainees make judgements about necessity and relevance? Necessity and relevance depend to a large extent on perspective. A course of action that feels necessary to one person may not to another. There is indeed evidence that people show different willingness to disclose mental health problems depending on whether they are motivated by prioritising their own needs (ego-system goals) – for example maintaining a desired self-image – or the needs and wellbeing of others and the self (eco-system goals). Within the context of the training environment, it seems worth considering whether we need to shift our focus from ego to eco-system motivations. There are implications of the decision to disclose or conceal. 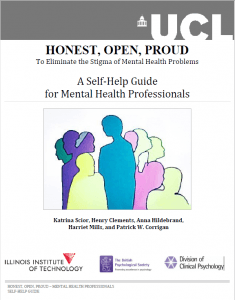 Recent work by Pat Corrigan and colleagues emphasises the importance of disclosure as a way of reducing self and public stigma, and their ‘Honest, Open, Proud’ programme was designed to support disclosure decision making. In our research, some trainees mentioned that they would feel more able to share their difficulties with people who had opened up about their own problems. A culture of openness may require people to take risks, and to consider disclosure within the context of eco-system goals. Additionally, psychologists such as Linda Forrest in the US, are keen to point out that not only trainees, but also qualified psychologists, are not actually very good at accurately assessing their own psychological needs and judging when disclosure is necessary. This has implications for a trainee’s ability to be an effective and safe clinician, as well as their own wellbeing. Our research suggests that we need to be thinking about training environments that ask trainees to take responsibility when it comes to mental health disclosure. This demands that trainees consider themselves to be leading the way in tackling societal stigma through openness. Yet for this model to be fully realised, training institutions need to be creating environments in which talking about lived experience is a safe and mutual process. For trainees to feel safe being vulnerable and transparent, those already established in the profession must be willing to be vulnerable and transparent. We cannot expect trainees to take risks, pursue eco-system goals and battle with their perfectionism, if supervisors and tutors are not leading in this behaviour.